Leo’s shadow is probably one of the better known shadows of the zodiac. This is because nothing Leo does is small or unobtrusive. Everything is big and a little larger than life. That includes his shadow side. We might call it the ‘I, the King’ syndrome. The phrase ‘I, the King’ was used by the Holy Roman Emperor Charles V during the sixteenth century, and it meant he ruled the world and no questions asked. If a document was signed, ‘I, the King,’ that was it. You didn’t discuss, debate, argue, negotiate, or even mention it again. You simply obeyed. The scenario goes something like this. FRIEND TO LEO: I’ve decided to look for another job. I’m really sick of working for insurance. I’d like to find something more creative. LEO: I have just the thing for you. You can work for me. I need someone to edit my film scripts before they go out to the cast. You can do the editing and proof-reading. FRIEND: But I don’t know anything about films. LEO: I’ll teach you. (Tone of voice becomes expansive, magnanimous.) We’ll start you at a fairly small salary, of course, but after all, you’ve no experience, but as you learn we’ll increase it. Say twenty pounds a week. FRIEND: (Torn by guilt. Disgusted at the suggestion but grateful to be given the opportunity to enter a new field.) That’s pretty small. LEO: But you’re inexperienced. Don’t worry. It’ll get bigger. FRIEND: Thanks for that increase. By the way, I tried my hand at a small piece of scripting myself. I’d appreciate your comments. LEO: Of course, of course. I’d be glad to read it. I bet you’ve got a lot of potential. FRIEND: You used my idea. LEO: What are you talking about? FRIEND: The film script. You took my idea and wrote it into your own script. LEO: Don’t be ridiculous. That was my own original idea. Look, I don’t like your tone of voice. It was my generosity that got you into this business in the first place. You would still be working in the insurance office if it hadn’t been for me. I did you a favour. This is how you repay me. That’s really pretty bloody ungrateful. I had that idea a long time ago. You surely don’t think I got it from your silly script. Look, you’ve been working hard. Tell you what, we’ll give you another five quid a week and put you on camera direction. That’s something you don’t know much about….. This scenario illustrates several facets of the Leo shadow. The first part sometimes peeps through Leo’s magnanimity. Sometimes that generosity is genuine, and nobody in the world can be so generous and open-handed as a Leo. But when the shadow creeps in, it isn’t all genuine. There’s an ulterior motive at work. For one thing, Leo loves to be needed; he loves to feel people depend on him. Sometimes he forgets that encouraging a person’s own individuality is just as important as always giving. Sometimes receiving a gift can be even more important. Leo sometimes gives and gives but won’t receive because it puts the other person on an equal basis with him, and takes away the obligation. Also, Leo sometimes unconsciously surrounds himself with creative people so that he can shine himself. This happens when Leo isn’t doing what he loves, when he hasn’t got a chance to create himself. But then he doesn’t reward them with the recognition their efforts deserve, and sometimes – unconsciously – takes the idea as his own. He may play on the fact that he was the one who gave them the break, or the favour, and never really allows them to go free to blossom on their own. And when they protest, he has a knack, with all that charm, of making them feel guilty and unappreciative when he has been so generous and so tolerant. It’s difficult to know what to do with a Leo in this kind of mood, because it’s his own insecurities breaking through that make him behave in this less than honourable fashion. You know you’ve been had, but there’s nothing you can put your finger on. When you’ve been had by a Capricorn, or Virgo, or Libra you know exactly how and in what fashion. In fact, Leo is usually so generous and magnanimous that you can’t really think of any situation you can blame him for. So, he hangs on to you, and makes you feel good because you’ve helped him, and the Leo shadow gradually subsumes all your ideas and takes them for his own. It’s a rather dark shadow, this one. But Leo does everything in a big way, and his nobility is equally grand. Leo when he shines stands head and shoulders above everybody else; when he’s in shadow, he’s that much darker. The real root of this shadow is the ‘I, the King’ psychology. To Leo, the other people in his life are often extensions of himself. He genuinely believes that their creativity is his, their ideas are his, and that he has a right to help himself, because, after all, it’s all his universe anyway, and he’s the King. It’s a kind of blank insensitivity, a lack of recognition, of other people’s individualities. It comes from being so preoccupied with his own individuality. He doesn’t mean to do it. Some Leos forget to give credit to others for accomplishments when the shadow is at work. Or they fail to offer compliments and genuine encouragement. Leo, the King and Father, often believe that people he loves are his children. Unfortunately, the children have a way of rebelling against his autocracy. Then Leo feels wronged, and tells the world about it. This is one of the reasons why it’s so terribly important for Leo to develop his own creative outlets. He needs recognition for his own abilities, and should be prepared to put plenty of time and energy into making sure he produces something that can earn it. The lion who hasn’t created anything too often becomes sour and jealous, and then you see the shadow peeping through. He’ll try to steal centre stage from anyone who happens to be on it, forgetting that they might have worked hard to get there. There are other adjuncts to this shadow. One is the ‘I know what’s best for you’ pattern, which afflicts many otherwise warm-hearted and honourable Leos. They mean well. Really, they do. Their advice is helpful, and they offer it freely, and are incredibly generous with their time and their efforts to assist you. The trouble is, you might not have asked for it. Leo has a reputation for sometimes being pretty interfering. And sometimes it can be maddening, especially if the Leo happens to be your mother or your best friend, when they invite themselves to sort out your life for you and then look so desperately hurt when you reject their advice. Leo needs to be needed. Even more, because his myth is the hero myth, he needs to be looked upon as a redeemer, someone who’s really done something for others. If he can’t redeem somebody, then how can he be a hero? And if you protest – say, because you don’t really need redemption, or would prefer to find your own – then he thinks it’s your fault, because you’re ungrateful and unappreciative. it all because he’s got to be king. Even when his contribution is patently absurd and glowing with florid ignorance, he won’t back down. I once knew a Leo like this. He would profess knowledge about all sorts of things, because he needed to have an image of being highly learned. If you questioned him, he would begin to argue. Of course he was always right. How dare you challenge it? What? Not know the answer? He knew everything. He would even get indignant and angry if you questioned him, to cover up his inadequacy. I, the King. What can Leo do with this shadow? Well, a lot of it requires being very, very aware of oneself. Leo has a hard time being aware of the needs of others because he takes a lot for granted. Leo isn’t a sign of relationship like Cancer, Libra and Pisces. But Leo needs to make this gallant effort of noticing what his own behaviour does to other people, and allowing them their independence and the credit due them, if he isn’t to lose his friends and loved ones through enmity and antagonism. Enmity is agonizing for Leo, who needs so badly to be loved. We’ve said that the Lion doesn’t have a mean, petty bone in his body, and that’s perfectly true. But his shadow can be a bit of a bully, and trample unnecessarily over the wills and desires of others. Unless he’s able to put time into his own creative expression he runs the risk of robbing other people of theirs. It’s not an easy task. But it’s one worth striving for, and suitable for the genuine nobility of character that is the real basis of Leo. 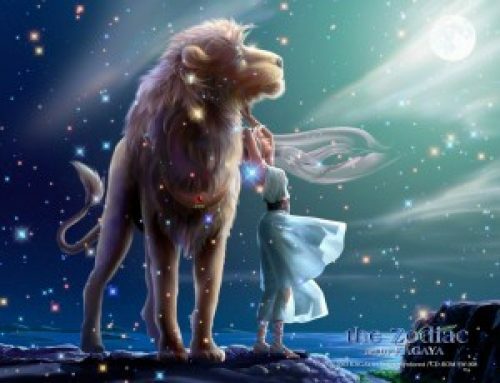 There is a beautiful image in the Tarot deck which describes Leo very nicely. This is the card for the Sun. It shows a small child crowned with a wreath of flowers, riding horseback on a horse, with his arms and legs thrown out in the air in joy. He isn’t even hanging on to the horse, so trusting is he of the bounty of life. Behind him, a huge sun shines. This is the Leo who trusts his own inner self. He doesn’t have to own others then; he’s just himself, and it’s good to be alive. Shadows have a way of disappearing in the noonday sun.